Central Board of Secondary Education (CBSE), Delhi. The Central Board of Secondary Education (CBSE), Delhi will be conducting the Central Teacher Eligibility Test (CTET) for a person to be eligible for appointment as a teacher for classes I to VIII on 20/09/2015. Candidates can apply On-line for CTET Sep-2015 on CBSE/ CTET website. The CTET shall apply to schools of the Central Government (KVS, NVS, Tibetan Schools etc.) and school under the Administrative Control of UT of Chandigarh, Andaman & Nicobar Islands, Lakshadweep, Daman & Diu, Dadra & Nagar Haveli and NCT of Delhi. Application Fee : Rs.600/- for only paper -I or II (Rs.300/- for SC/ST/PWD candidates) OR Rs.1000/- for both papers (Rs.500/- for SC/ST/PWD candidates) online through Debit/Credit Card or download Payment Challan for payment in the designated accounts of Syndicate Bank/ Canara Bank in favour of Secretary, Central Board of Secondary Education, Delhi. How to Apply : Apply Online at CBSE CTET website from 30/07/2015 to 19/08/2015 only. 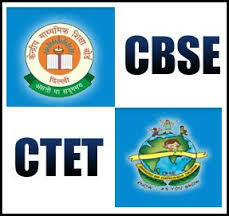 Please visit http://ctet.nic.in for all the details of examination, syllabus and online submission of application.